Yep, I am officially wiped out. My mind says I need a long walk in the spring sunshine. My feet think I should read a book. I have been one busy Easter bunny. A large assortment. Great colors, lots of fun! 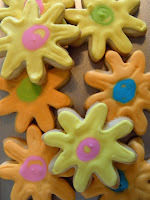 I did last years cookies a little differently and have a link here. When my friend called and told me she needed baby shower cookies, I was delighted. Since making baby cookies for Christina's teacher that my sweet, adorable daughter told me were "creepy", I was ready to redeem myself. I never disclosed if I was having a boy or a girl, but from a cookie decorator's standpoint, it sure helps to focus on blue or pink. And I focused on blue! 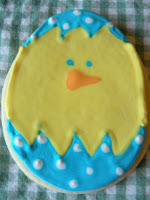 They turned out pretty darn cute, if I may say so. 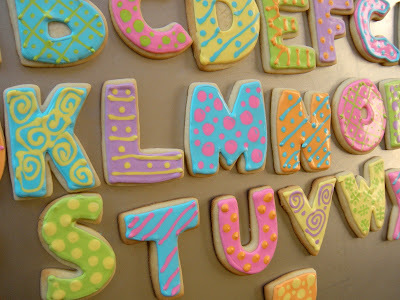 These alphabet cookies are for a wedding shower and the theme was A to Z. So since spring is trying to emerge in the Mid-South, I decided to ramp up the color palette. I love these gel colorings, they can be hard to find locally, but of course the internet has lots of options. 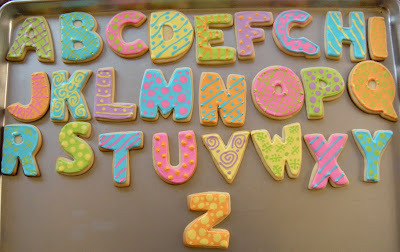 This was a little more tedious than most decorating projects, but what fun to decorate cookies and watch Netflix! 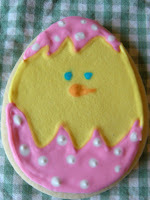 If I thought anyone wanted to know how to decorate sugar cookies, I would be happy to put up some instructions. But most of my readers that I know are admirers not bakers. And hey, that's good for me too! AhhhhhChooo! That is me, over and over again. My nose is runny and raw. My joints ache and I am living in a fog. I hate being sick. Honestly, I hardly ever succumb to it. I can usually feel it coming on and pound the EmergenC, the Advil and the power of positive thinking. But not this one. Scott got off a plane over a week ago and said his seat mate was coughing and hacking the entire trip, the type of virus transmittal that hand sanitizer just can't touch. It took a good 4 days to incubate and then hit him like a ton of bricks. He did a dandy job of self diagnosis and started a ZPak. It took 3 days, but then I got it. A milder version, no psychedelic snot, so no infection, just a nasty cold. Blech. So this is the reason I have no Daring Bakers Tiramisu post. I'll get there, it'll be excessively late. This is the reason we are eating thawed and reheated Minestrone, ordering pizza, turkey burgers. I don't feel like cooking, baking and certainly not doing dishes. But oh, that Minestrone. 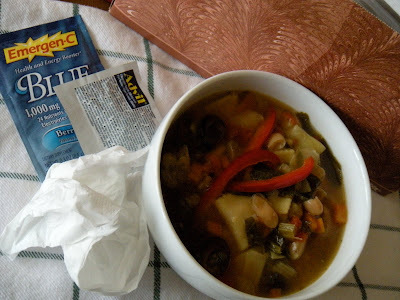 Then I realized I have never blogged my soup. My yummy Tuscany Bean Soup. There is always some in the freezer for times like these. Heat the oil in a 6 qt. pot and add sliced sausage. Add onions and garlic and saute until translucent. Add celery and carrots and cook for another 3-4 minutes. Add beans, broth, tomatoes and olives.. Season to taste with salt and pepper and bring to a boil. Simmer for 15 minutes on low heat. Add artichokes, vinegar, sugar and sherry. Cook 5 minutes. Remove from heat and add parsley and tarragon. I like to add tortellini or mini ravioli too. Sometimes I add and subtract ingredients, zucchini, mushrooms whatever. It freezes very well although tortellini get mushy being reheated. I suggest adding fresh red bell pepper to reheated soup for a fresh crunch. 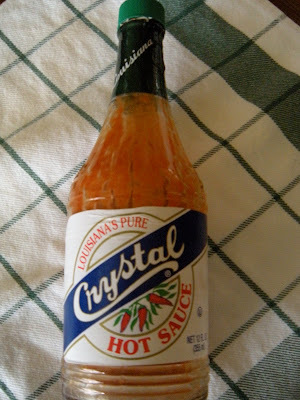 And don't forget the Queen of Condiments, Crystal Hot Sauce, that opens up the sinuses. The magic cure. Put it in everything, it even helps a sore throat. Make sure you have chapstick though, because it is murder on chapped lips! I was feeing guilty hanging out in sweats all day. Watching movies, spending hours on theInternet, playing Bejewled, reading books. Then I realized, God, I love being sick. I'll be back with Tiramisu when the sun is shining and I am breathing free and clear. Until then...Netflix upload!